There is nothing worse than watching a student struggle with a math problem because they’re not sure where to start or misinterpreted the question. Enter the CUBES math strategy! C- Circle the key numbers. It is important for students to recognize that sometimes there are numbers given in a question that are irrelevant to the problem itself. By circling only the key numbers, the students are forced to pause and think about which numbers they actually require in order to answer the question. Similarly, problems can sometimes be overly wordy and the students lose track of what they’re being asked to do. The students gain a clearer understanding of what the problem is actually asking them to do by finding and underlining the question- and they become aware if they have no idea what the question is at all! B- Box any math “action” words. For this step of the strategy, students have a tendency to box all the math words rather than the math action words, so it is important to explain this distinction. As the question will not always use explicit math action words (e.g. multiply, add, explain), the students need to also be looking for implicit math action words (e.g. how many? how far? how long?). Organization of thinking is half the battle for some students. If the students can identify the steps they need to take to answer the question before they begin to tackle it, it can alleviate frustration later on. By generating a plan of action, students often feel better prepared to attempt the problem and can sometimes identify errors in their proposed solution before carrying it out. While solving the problem is obviously important, checking the answer using a different strategy is equally as important for students (i.e. can you solve the problem a different way and still get the same answer?). Not only does this give students confidence in their answers, it enables them to identify and fix their errors and double check that their answer makes sense. Try implementing this strategy by reviewing a problem that your students have already solved so they can focus on the CUBES strategy itself. 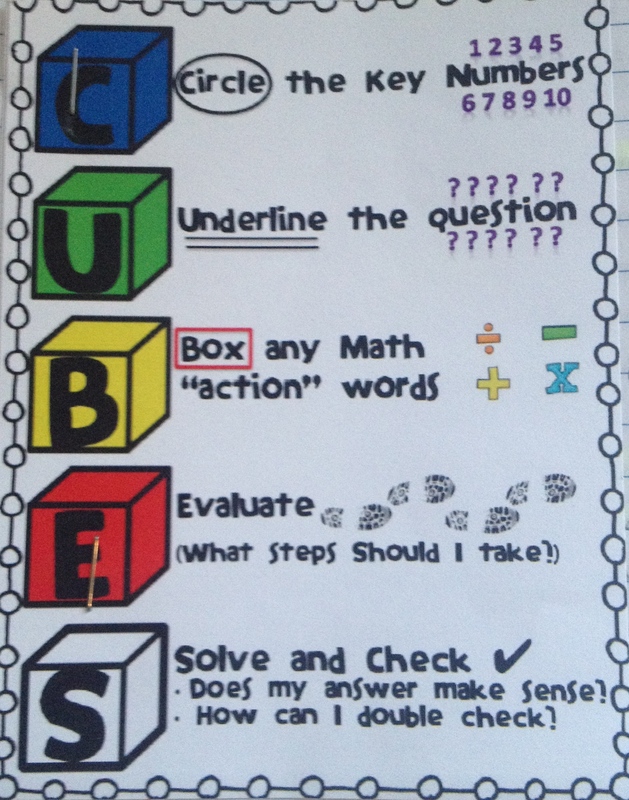 You could also put up a poster describing the CUBES strategy in your classroom, and distribute mini CUBES handouts (as pictured above) for students to glue in their math notebooks. Happy problem-solving!